A few months ago we drove a couple of Audi A5 Cabriolets with the their roofs open on a wet, windy wintery day in Adelaide – and were pleased to find the combination of heated seats, warm air being blown onto the back of our necks and an air blocker behind the front seats made life significantly more comfortable than expected. By way of sharp contrast we’ve just spent a most pleasant week at the wheel of an A5 Cabriolet in our home area on the Gold Coast, plenty of that time with the roof open to enjoy the warm weather. It has to be admitted we were glad the roof could be raised quickly while moving at up to 50 km/h because the GC managed some thunderstorms and bucketing rain by way of variety. The roof opens in just 15 seconds and takes 18 seconds to close and is operated by a single touch on the appropriate button. 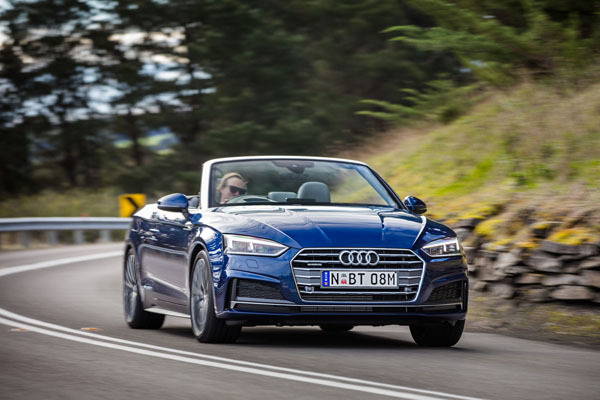 Audi A5 and S5 cabriolets are the third variants in the all-new ‘5’range, following on the sedan and coupe which were introduced midway through 2017. Styling is excellent, a feature that really impresses our aesthetic side is the almost invisible ‘shut’ lines that are part of the swooping wave-line on the latest A5s all the way from front to rear. Clever design means the Audi Cabriolets look almost as good with their soft top up as down. Which is important as, sadly, many open-top drivers tend to have the roof closed most of the time. Inside, the typical Audi attention to detail and immaculate quality works brilliantly. Audi A5’s model range comprises a two-wheel-drive (front wheels) with a 2.0-litre four-cylinder turbo-petrol engine and 140 kW of power. Torque of 320 Nm comes in at an impressively low 1400 revs and stays at that level till 4200 rpm. Changes will have the engine at full grunt virtually all the time. Then there’s a quattro all-wheel-drive A5 with the same engine but re-tuned to give 185 kW and torque of 370 Nm from 1600 to 4500 rpm. This was our test vehicle’s powertrain. 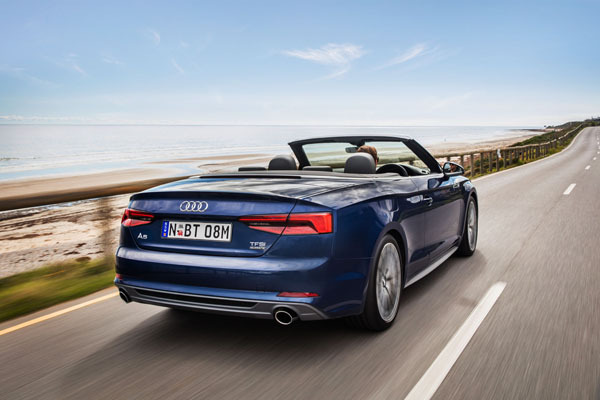 All Audi A5 Cabriolets have a seven-speed dual-clutch automatic transmission. An 8.3-inch high-resolution colour monitor can be duplicated in the central panel of the Audi virtual cockpit. There’s MMI navigation; Google Earth and local search; a DVD drive; a 10 GB flash memory; two card readers; and Aux and USB connections. Smartphone interface integrates iOS and Android. Audi puts a big emphasis on electronic driver assistance systems to prevent the car being crashed. Should the worst happen it has high levels of protection for all occupants. This is led by a strong body built in modules that also keep weight down. Performance from the 185 kW engine is likely to be more than enough for the majority of drivers. There’s a minimum of lag and the transmission quickly senses the need for more urgency and shifts down a cog or two to add to the torque being supplied by the engine. The latest Audi Cabriolets are longer overall and in the wheelbase so have better space in the rear seats than before. As is the norm in this class, the lost width in the rear due to the folding soft top means there are two seats, not three. And the two have pretty limited leg and kneeroom unless those in front are willing to give up a fair bit of space. It’s probably best to regard the open-top Audi as a three-plus-one, that is with the two seats of the left being used by adults without too much need to compromise, and the seat behind the driver relegated to a junior traveller. Boot space is good for a convertible and we found it could take three cabin bags. The drop down area that houses the open top is powered up and down, not done manually. The new generation Audi Cabriolets are lighter and more rigid than their predecessors thanks to a clever modular platform. There is some mild scuttle shake on rough roads, but on the whole you almost feel as though you’re in a sedan. Obviously there’s some wind noise with the top down, but it’s muted to the level that lets you enjoy the sound without it overpowering conversation. A clever feature is tiny microphones built into the upper surfaces of the front seatbelts to pick up your voice during mobile phone conversations. Handling is fine for a grand tourer, with a near neutral feel and plenty of electronic assistance to help the Cabriolet around bends at speed. Audi A5 is an attractive convertible that works very well in summer or winter. Certainly a machine that deserves a spot high your list of vehicles to be taken for a test spin – preferably with the top open. Note: These prices do not include government or dealer delivery charges. Contact your local Audi dealer for drive-away prices.